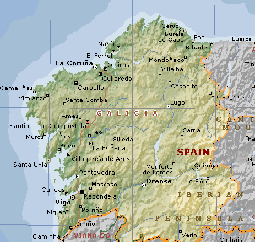 Galicia is divided into nearly 3,800 parishes, areas typical of Galicia and which have their origins in the Swabian system of administration. Every parish has its own fiesta or fiestas, mostly held in the summer, and it is easy to imagine just how many celebrations are held all over the region. As well as these popular fiestas, there are also countless romerías (religious processions to a holy shrine) and religious and secular festivities, which have derived from the rich and varied traditions and stories of Galician folklore. A few, just by way of example, which celebrate Spring, the bonfires of San Juan, the Summer Solstice or the Magosto, when the first chestnuts are roasted and the first wines tasted. Among the most original fiestas, unique to Galicia, are the curros, or Rapa das Bestas (The Capture of the Beasts), an extension of the work of the stock breeders, who bred wild horses in the mountains. Some twenty curros are held between May and August in various places in the provinces of Lugo, La Coruña and Pontevedra. Galicia is also renowned for the spectacular nature of its carnivals, particularly those in Laza (Verín) and Xinzo de Limia..
Gastronomic fairs also deserve their own section, beginning with the Cocido Fair in Lalín, and following on, in chronological order, with a whole host of other fairs: a Cheese Fair in Arzúa, Eel in Tui, Lamprey in Arbo, Pepper Fairs in Arnoia and Padrón, Salmon in A Estrada, Bica (a type of cake) in Trives, Seafood in O Grove, etc. and ending in December with a Capon Fair in Vilalba. The four provincial archaeological museums, located in the capitals of the provinces of Galicia and particularly the one in Pontevedra, house large exhibitions of surprisingly rich, varied and rare Galician archaeology. The most original pieces are those belonging to the culture of the castros, (Iron Age settlements) which have bequeathed us an extremely rich collection of jewels and gold objects. There are other fine museums to visit as well, such as the Fine Art Gallery in La Coruña, the municipal Castrelos Museum in Vigo or the Museo do Pobo Galego (Museum of the People of Galicia) in Santiago, not to mention almost a hundred other small, official museums spread throughout Galicia. To call them ‘small’, however, may seem strange when on visiting them, as some turn out to be quite the opposite, such as the Museum of Religious Art in the Cathedral of Mondoñedo, the museum in the Monasterio de Oseira, the Tui Cathedral Museum or the Tapestry Museum to be found in Santiago Cathedral. As well as prehistoric art, with the many dolmens and cave paintings worthy of mention, there are also some spectacular Roman monuments to be seen in Galicia, including the walls of Lugo, the Torre de Hercules or the Roman bridge in Ourense. Some outstanding examples have survived from the Swabian and Visigothic periods with the finest to be found in Celanova and in Santa Comba de Bande. But it is the Romanesque art of the twelfth and thirteenth centuries, represented by the five hundred religious buildings of this style, and which crop up in every corner of Galicia, where the Galician genius for construction comes to the fore. It is followed in importance by the Baroque, represented in complex facades, in the graceful towers and in their breathtaking altarpieces. Among these the Obradoiro facade, which conceals the original, early-Romanesque facade, is an obvious example. As for the countless altarpieces, perhaps the best example is to be found at San Martín Pinario in Santiago, or perhaps the one in the church of the Monasterio de Celanova, or even Lugo Cathedral. These artistic Galician traditions are still evident in the three major art forms. There is enough evidence if you visit the church of Santa Cruz de Carballiño by Antonio Palacios, the many sculptures of Asorey or the Bienales de Pintura (biennial art exhibitions) in Pontevedra. Among the minor arts, Sargadelos ceramics, lace making in Camariñas, the silver work and jewellery of Santiago are perhaps the best known.